Carryings On Up The Dale: Leuthen refought. Frederick demands a rematch. Leuthen refought. Frederick demands a rematch. On Thursday I organised a refight of Leuthen using Honours of War. Robbie brought Dave Jarvis along, and Dave brought some very nice freshly-baked contraband in the form of some muffins. John was unable to make it unfortunately so Robbie played the part of Charles of Lorraine while Dave was Frederick and I was Zeithen. Those of a superstitious nature might have been interested to see that I had unwittingly given Robbie my mug depicting a scene from the Battle of Leuthen. Worse still, Dave had a Rossbach mug although I did have Hohenfreidberg. (Check them out on Amazon). The actual anniversary of the battle is on Monday 5 December but none of us were free on Monday, despite us being gentlemen of leisure. It's such a busy time being retired. We've done this game a few times now (5?) using both HoW or Black Powder. In every occasion it's been a hard slog for the Prussians who have only managed to scrape a couple of marginal victories. I have always used the scenario described in Charles S Grant's Wargaming in History Vol 4 (without the table shift) which has always seemed to feel right in terms of troops numbers etc so I can only lay the blame for the Prussians lack of success on generalship, usually mine, of less than Frederickan quality. For this game we dispensed with the bounce through rule as I reckoned that the snow would negate the effect significantly. I've made an attempt at 'wintering up' the photos by fading them significantly using the app. on my computer. I've not yet mastered how to put falling snow into the pictures but I think they don't look too bad, and it certainly looks cold. The battlefield at the start, with the Bavarian/Wurtembergers retreating having been driven out of Sagschuttz, closely pursued by Prussian horse. Rot Wurzberg in the churchyard supported by other Austrian units as the Reichs troops retire. 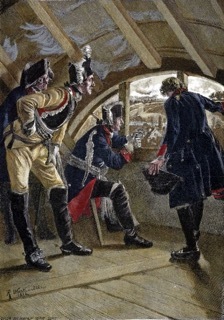 Anhalt Dessau's troops enter the fray. Dave's advance guard was slow in, er, advancing but my Cuirassiers on the right wing moved forward to threaten the retreating Reichsarmee units (representing the Bavarian and Wurtemberg contingents). 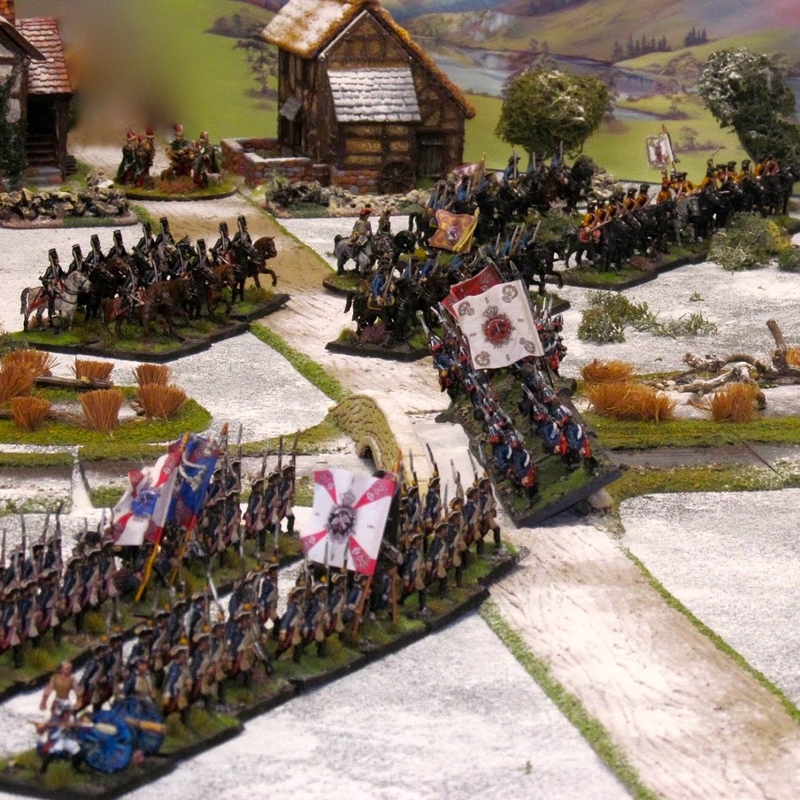 The Prussian hussars in the centre seemed rooted to the ground and failed to respond to Robbies Austrian hussars who were sweeping round our left flank. Our main body arrived under Anhalt-Dessau and immediately thrust forward towards Leuthen. The reserve under Forcaide was delayed for a turn although the artillery did arrive on time, it was very slow to deploy. 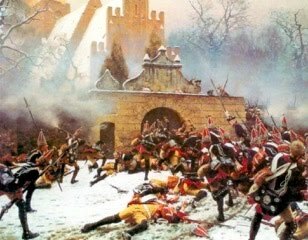 Indeed if it were not for the two regiments of Prussian hussars sacrificing themselves the as yet unlimbered artillery could well have been overrun by the Austrian hussars who got dangerously close to doing so! But I am getting ahead of myself. Rot Wurzberg leave the safety of the churchyard. Why? Meanwhile the Prussian cuirassiers take on the Reichs troops, already depleated following their ejection from Sagschutz. The Reichs battalions (two of them) are broken. In the foreground the Prussian horse are massed ready to take on the Austrian cuirassiers to their front. What followed was to follow was a most sanguinary combat with both sides taking a hammering. The surviving Reichs troops withdrew on Leuthen and formed a line of sorts to face the oncoming Prussians. Anhalt Dessau and Forcade's brigades enter the table and advance rapidly towards Leuthen. Serbollini's cavalry advance against the Prussian right. In the Prussian centre things are getting a little out of hand and confused. The hussars are being battered by the Austrian guns and are not getting their orders, the artillery is slow in unlimbering and the infantry is attacking too quickly and piecemeal. Grrrr! The infantry in the centre clash. In a furious round of shooting and an impetuous bayonet charge both front ranks are shattered, which was not part of the plan if you were a Prussian. The Rot Wurtzberg regiment pays for stepping out of the churchyard and break as they face a brutal charge by Prussian grenadiers. They gave as good as they got as the already battered grenadiers are also broken. A large gap had appeared in the front lines of both armies, ripe for exploitation. 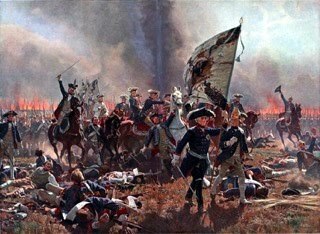 The Prussian right wing cavalry were fighting a slow loosing battle against the more numerous Austrians, and despite some success, several units had been broken or driven back. In the centre the Prussian Guard successfully broke into Leuthen, driving off the Reichsarmee battalion that was taking refuge there. 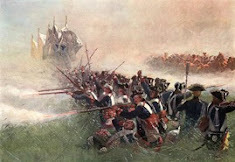 Another battalion of Prussians attacked the church although their supporting battalion was broken. The Prussian right is starting to buckle under the pressure. By this time the only Prussian brigade remaining unscathed was that of Forcade, who were making short work of the surviving Reichsarmee battalions whilst keeping one eye on the cavalry battle on their flank. The Prussians finally broke into the churchyard. Would they be in a good enough condition to hold it? No. A rapid counter attack by the Austrians drove them back out again. The Prussian left wing cavalry under Dreissen made their appearance on the flank of the Austrians, but the latter were able to turn and countercharge. Both sides took heavy casualties and the Prussians failed to break the Austrian horse. More Austrian cavalry appeared facing the battered Prussian left wing. The main Prussian artillery battery had finally got into action and was starting to make its presence felt among the Austrian infantry and cavalry to its front. But it was too late. By this time the Prussians had reached their army break point, due largely to the gradual disintegration of the cavalry on both flanks and the piecemeal infantry attacks in the centre. Frederick threw in the towel (well Dave and I agreed that we'd messed up). Then again we were well aware where we had gone wrong so there was something positive to drag from the debacle. Yet again the Prussians had failed to gain a crushing victory, and didn't even manage a minor one. Maybe next year. It was a good result and a hard fought game and credit must go to the Austrians for more than holding their own. The rules worked well, certainly we were starting to remember them much better, certainly better than the previous week. 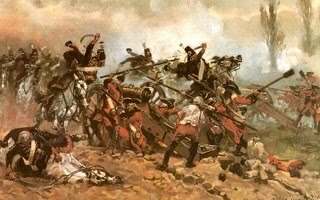 The 'house rule' we have reducing the range of effective canister feels right and the decision to ignore the bounce through rule for this game had no impact although if the Prussians had been able to get their artillery into action sooner it would have been useful. I'm much happier with the rules now. My one reservation is the fact that cavalry melees tend to be mutually destructive especially as one fights them until there is a result in one game turn. What next for Frederick? He falls back, passing the wreckage of his artillery and cart loads of wounded men. Well done all of you - it looks a very good game and I'm glad HoW is vindicated after Robbie writing he was out of love with them. You've done a good job with the photos Colin, making them atmospheric by subduing the colours was a good idea. It's hard work trying to cover up the green bases. Very nice Colin. I always admire a winter table and yours is excellent. So atmospheric! A wonderful report, great looking table and nice computer job, we are in the heart of the action...and nearly on anniversary date! Well done on presenting a great battle report. Love the wintering effect of the photos, gives a certain chill! Glad you find it hard with the Prussians, I find a similar painful outcome whenever I play as Frederick. Grand stuff Colin, just the spur I need to make a start on the Prussians Dave kindly gave me. A lovely game, Colin, a real feast for the eye. Congrats to all of you on what looks like a very challenging game. Thanks everyone. It was a great game. It was a bit cold but the Prussians didn't suffer as much as they Got MIT Uns. Still not as enamoured with the rules as I was when they first came out though. Splendidly cold looking game there! I nearly started shivering before the end of the AAR!